Are Email Campaigns Part Of Your Marketing Strategy? 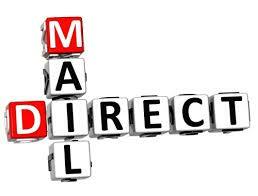 Lately we’ve focused quite a bit on direct mail and specifically on Every Door Direct Mail. Let’s not forget that there are many marketing channels available to you and, often, a mix of these channels is the best plan for getting your message across. Email marketing does not have to be intimidating. It is a simple, effective means of communication when you keep these tips in mind. Make the message relevant. Tie the subject line neatly to the body of the email. Be brief! No one wants to read a long, drawn out email. Studies show that on average, people spend about 15 – 20 seconds with each email message. Test the email through several different email clients, both in text and HTML. You’d be surprised how different one email may appear through different devices. Make sure your email list is appropriate. Whenever possible get permission to email a person or place of business. Properly executed, email marketing provides you yet another avenue for reaching and speaking to your customers and prospects. Why not make an email campaign part of your marketing strategy? 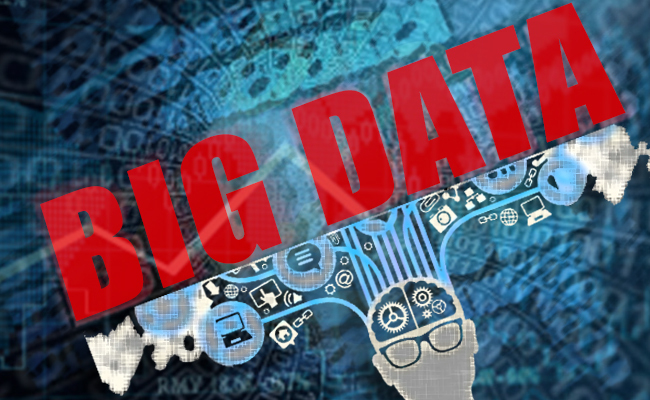 Data Tips | Don’t Let All The Talk of Big Data Scare You Off! Don’t Let All The Talk of Big Data Scare You Off! Decide on a strategy: How can you improve your current strategy with data? Think about what data you want to collect and how it will be used in future marketing efforts. 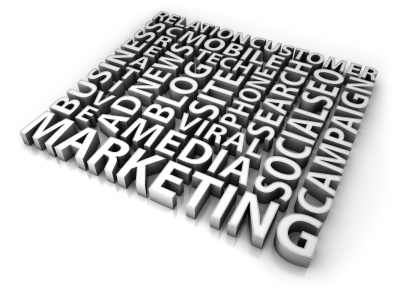 How will this affect the marketing channels you choose – direct mail, email, social media? What do your customers want? Identifying what matters to your customers allows you to improve your communications with them. This also helps you craft and target personalized messages to customers through any of the marketing channels you may choose. Don’t ask for too much: Give some thought to what data you really need right now. Do you need to improve your email address list? Find out what services/products are most important to customers? Determine how satisfied they are with your business? Keep it short and simple for them to respond. You can always dig deeper for more information down the road. Give multiple methods of responding: If you are using direct mail to contact customers/prospects, include a website where they can submit information, take a survey, etc. Consider response cards, pURL’s and QR codes. Make sure all pieces are mobile compatible. Test, test, test to make sure all of your communication platforms work seamlessly. Don’t get overwhelmed or discouraged: Data is a big area and can be a lot to wrap your head around. Start small. And don’t expect overnight success. Build on what you have and tweak your communications as you add more data. The most opened and read mail consumers receive are transactional in nature. Statements are related directly to where their money is going so it earns a higher spot in the hierarchy of mail box content. So how can you get the most out of this opportunity? Easy to read, easy to understand statements. The number one complaint people have about their bills and statements is that they are difficult to read or hard to locate crucial information. Review your statements – is it clear how much they owe and why? Is it easy to locate a customer service number if they have a question? Have you spotlighted a way for them to contact you or pay their bill online? Think about ways you could utilize highlight color to draw the attention to specific information or perhaps give a better flow to the overall design. Mobile applications. So many people are deeply connected to their smartphones, why not offer an opt-in and provide due date reminders or notices when their statement is ready? Think of this as another way to improve your cash flow by receiving payments timely. Mobile payments, provided they are device friendly, can help deepen the relationship with your company. Electronic billing or e-statements. Do more than offer a simple pdf. Your e-statement should match the printed statement for a clear, cohesive customer experience. 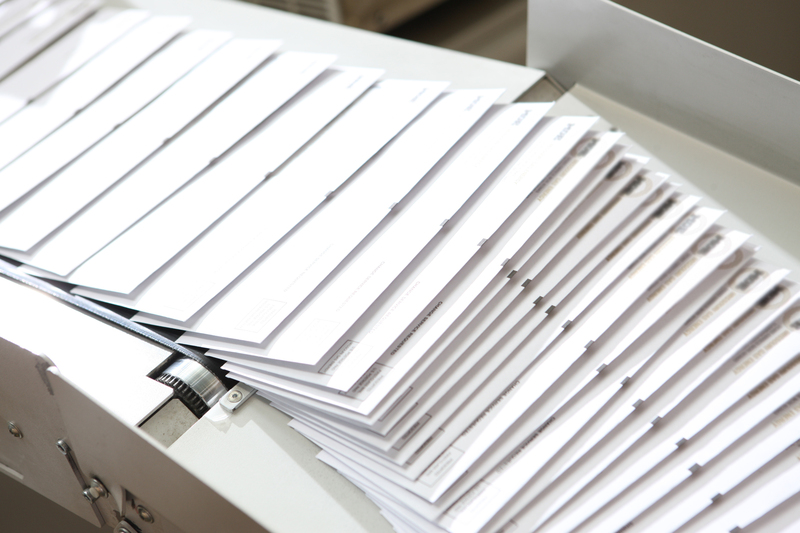 Using your printed statement, offer an opt-in to receive only electronic communications. Include a website where customers can view, pay, review past statements and even view special offers. Special offers and marketing messages. Use your statements, both paper and eStatements, to make relevant offers of products/services, tips for savings and other marketing communications. Again, make sure any electronic statement matches your mailed (paper) statement. In short, make the customers experience as easy and concise as possible. Provide multiple methods of statement presentment and use the real estate on your statement to highlight special communications and offers. Questions? 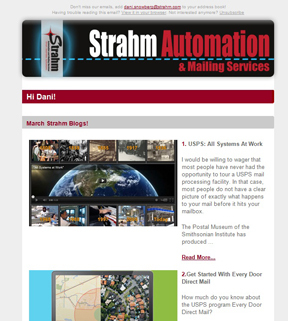 Feel free to contact a Strahm Client Service Representative at (816) 756-2733. Does it seem to you that digital is taking over everything? 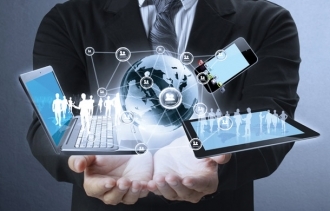 Technology may make it seem like traditional methods of marketing, advertising and communications is going extinct. A study conducted in October 2012 by Millward Brown, stated that physical media like direct mail left a “deeper footprint” in the brain, as opposed to digital media through some sort of technology. The study makes a strong argument that our brains respond differently to digital vs. physical media. Direct mail and other physical media continue to be powerful tools in marketing and communications. The study was titled Using Neuroscience to Understand the Role of Direct Mail. Presenting physical material resulted in greater emotional processing, more “real” to the subject, which is important for memory and brand associations. This tangible experience is more readily internalized, which means the ads should have a more personal effect thereby positively influencing motivation. Does this mean you should abandon digital media such as email marketing, Facebook and Twitter? Not at all. A well planned program of both digital and physical communications will increase your chances for success. How are you combining digital and more traditional physical marketing? Where and how have you experienced the most success? Infosys recently released a study “Engaging with Digital Consumers” which offered valuable insight into what consumers want and how your data driven marketing plays a role. 57% said they would be “more likely” to make a purchase from a retailer again if the retailer kept them updated on new offers and services through social media. 78% of consumers said they would be “more likely” to purchase again if provided with offers targeted to their specific interests and needs. 45% said they would be willing to trade “some privacy” for offers specific to their individual shopping needs. 43% said they wouldn’t mind if retailers’ apps tracked their phone’s or tablet’s location if it meant they would receive ads or promotions targeted to their local area. Data is so important to driving your marketing campaign. As marketing continues to move toward multi-channel applications, you have increased opportunity to gather data from digital marketing and apply it to printed pieces and vice versa. 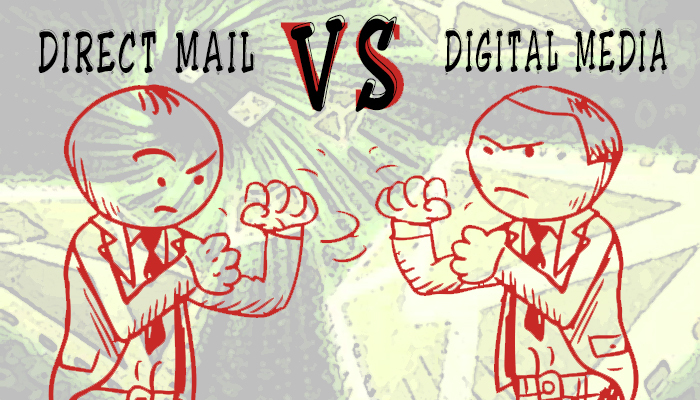 Here are a few ways you can use digital and print both to build your marketing database. Beef up your data and help make consumers “more likely” to buy from you and continue to buy from you in the future. Have questions about data driven multi-channel marketing? Contact us at sales@strahm.com or (816) 756-2733 and one of our qualified Customer Service Representatives will be glad to help! How often do you “reach out and touch” your customers? 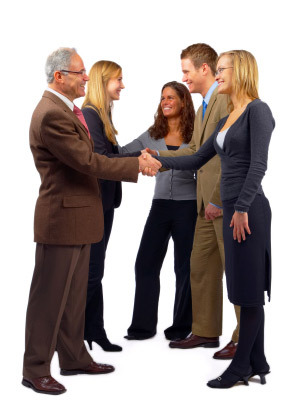 On average, it now takes nine touch points of communication to build a sales relationship. Most sales people give up after three. The best way to lose a customer is to lose touch with him or her. Some data indicates that 60% of customer loss is due to lack of communication. Every prospect and customer should hear from your company at least every 90 days. Savvy marketers reduce this cycle to every 30 days. Sales force effectiveness increases by as much as 40% when supported by an effective marketing campaign. 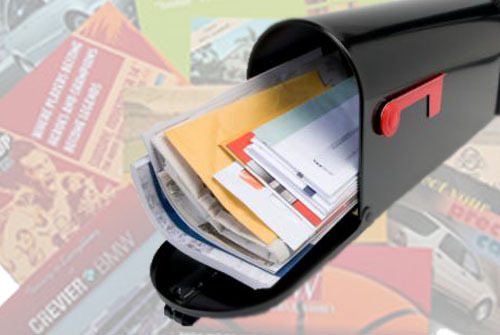 Direct mail as part of an ongoing campaign can reinforce your brand again and again. Mail is effective for creating and building brand awareness. Use strong, targeted messages when “talking” to your customers. How will your product or service help them? Customers are looking for one of two things – reducing or eliminating their pain or increasing their pleasure. It’s a simple as that. Phone Calls! When was the last time you just said hello? So how are you going to step out and communicate with your customers and prospects?